An easy way to describe «who we are», would be by adopting the official definitions of any Greek Language dictionary for terms such as, Marines, Association, Reserves etc. …under the Decision no. 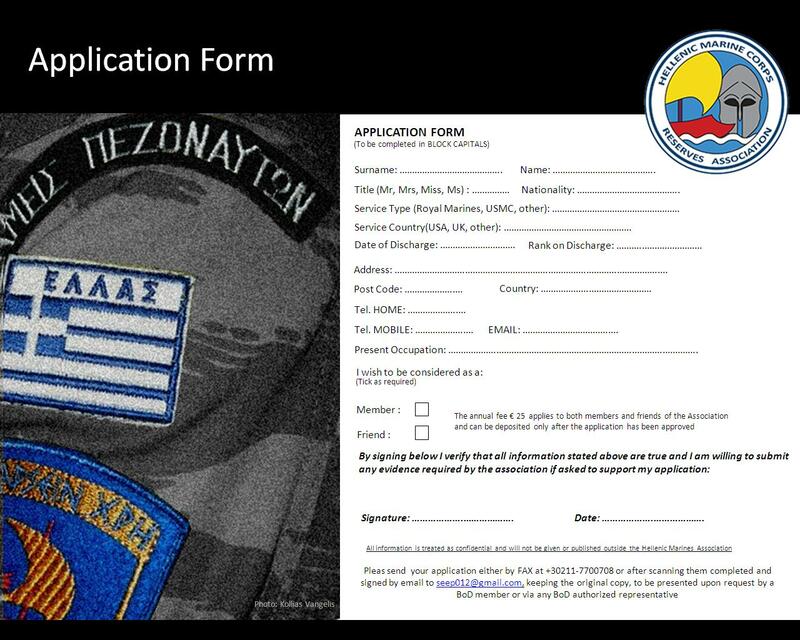 796/2013 of the First Instance Court of Athens, Hellenic Marine Reserves Association is a non-governmental, not for profit association, formed under a statute in Athens Greece, from those citizens who after performing their active military service as Marines (the dictionary defines them as, men of the Hellenic Army Special Forces, specialized and trained to conduct sea-invasion operations, neutralizations of bridgeheads near the coast, as well as defend and secure coasts, harbors and other coastal targets) and are assigned to various reserve classes, have established an association for the revival of their times in the military. This bureaucratic definition above is very banal, shallow and «shortsighted» since the image it presents regarding our community, fails either to capture the essence of our existence, which is our common background but also, to conceptualize the strong camaraderie bonds among our members which derives from this common background. This, official, and constrained common perception, is not something rare. For the outside civilian world, it is rather difficult to conceive, what is like, to belong to the Hellenic Special Forces family (of which an integral part, are the Hellenic Marine Corps). All Special Forces members have a strong sense of belonging into a family characterized by Higher Values, Military Ethos, Collective Awareness, and discipline defined, but not limited to, their respect to their Military Oath given when enlisted. It is an oath of allegiance, to the laws and constitution of our country. It is also their obligation as reserves to be ready to meet the demands of the official state against all external threats of its sovereignty. In addition, there exists a camaraderie and solidarity among all members making this association a “second home” – albeit, equally important to their primary one. In short, a community of Peers (Not Equals, as many times wrongly defined) who share the same Ideals and where everybody’s first priority is “the family” rather than “the individual”. This association focuses on the use of the abovementioned principles and values in order to reestablish the esprit de corps of community that all members once belonged. The one, which defines the Hellenic Marine Corps Family. And we do not stop there. Our mission upon which, as an association we have based our own existence (i.e. the preservation and promotion of Hellenic Military History and the history of the Hellenic Marines, the promotion of all ideals such as solidarity camaraderie – not only among members but also as a civilian’s community – and finally, our active involvement by being the communication lore between civilians, military personnel and reserves) demands for our organization to always try to apply the highest standards while at the same time to constantly pursuit of perfection in anything we do. Our aim is not to do things just to get by. We believe that, working that way is what, in the end, creates pride in our members. And on this constant fight for excellence and the preservation of the Hellenic Marine Corps Spirit we welcome you to join us.